Alternatively, you can still buy Thailand train tickets online via a reliable travel agency called 12Go.Asia which provides online ticket(s) booking for buses, ferries, trains & low-cost airlines for people traveling around Thailand and Southeast Asia. 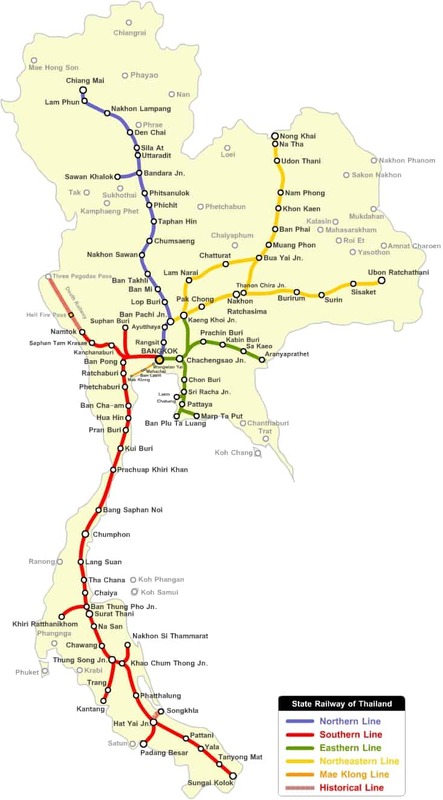 Thailand’s train railway map as per below. *Image credit: Ribble Valley Rail. Apart from online booking, there are other ways that you can buy State Railway of Thailand (SRT) train ticket. 1. In-person at the train stations. My personal recommendation would be 12Go.Asia as they’re very reliable and they have great customer support. At 12Go.Asia, the employees will purchase your ticket(s) on the first day they are released to the public / State Railways of Thailand allows bookings. The employees will wait at the railways counter when it opens, buy the tickets in your name and keep them secured until you come to collect them in Chiang Mai or next to Bangkok’s Hua Lamphong station. If collection in person is not possible because you depart from an other place than Bangkok or Chiang Mai, you can select the shipping option that they offer when you book the ticket(s) online. The printed tickets (on official Railways paper) are the boarding passes and need to be shown when you board the train. There is no real e-ticket available in Thailand and 12Go.Asia is the best solution to book tickets in advance and from abroad. Their system shows seat & berth availability so you can see which trains have places available and which are fully-booked, although they can’t offer real-time online booking. Basically, you order online, they buy for you manually and send you a confirmation once they have done so. It might happen that during that short time window the train you selected gets fully booked. In that case they will contact you and suggest alternatives. If a ticket can not be provided you will get a full refund of your costs, so there is no risk. Important: You cannot board the train with the emailed confirmation voucher, you need to collect the actual ticket before you travel, or have it sent to you if you can’t get to a collection point. An example of an original Thailand first class train ticket can be found below. How long in advance can I book a ticket? You must book at least 15 hours ahead but ideally you should book it as soon as you are absolutely sure that your travel plans will not change anymore. They’ll take bookings more than 60 days ahead but remember they can only buy tickets when the State Railways of Thailand open bookings. Booking more than 60 days ahead gives you the best chance to catch one of the relatively rare VIP first class tickets. 12Go.Asia charge the regular Thai Railways fare plus a pretty reasonable 220 to 250 Baht ($6) booking fee. On top of this comes a small PayPal / Credit card payment fee (4%) which will be shown to you when you choose your payment method. The price they show for each ticket includes the online booking fee but not the PayPal / Credit card payment fee (as this is charged by the banks). You pay securely via PayPal, either using a credit card or your own PayPal account, or you can choose their Visa or MasterCard payment channel provided by Omise, which is a bit cheaper. There’s no additional delivery fee if you collect tickets in Bangkok or Chiang Mai, and just a small ($4) fee for collection at Surat Thani or any other railway station. Bangkok: 12Go.Asia’s collection counter is in the DOB building opposite Hua Lamphong station and it opens 10:00-20:00 every day. There’s no added fee for collecting here. China Town and the famous temple Wat Trimit are in walking distance to their counter if you arrive early enough to do some sight seeing or shopping. Chiang Mai: You can collect tickets from the 24h Bossotel hotel reception across the road from Chiang Mai station, 70 baht fee, or from the station’s baggage room for 150 baht fee. Surat Thani: You can collect tickets from the station parcels office, open 24hours. Don Muang airport: You can collect here if heading north, but be careful the parcel office opens only from 09:00 to 20:30. If your flight arrives later than 18:00 you might not make it on time. And the railways staff in the parcel room will not wait for you. Nong Khai: You can collect from the station baggage office, for a 150 baht fee. Ayutthaya: You can collect from the parcels office. Worldwide delivery: You can also choose to have tickets to be posted to any addresses worldwide and they offer international shipping with DHL as registered mail. This costs around 100 baht ($3) to addresses within Thailand or 1,500 baht ($43) to addresses worldwide including Europe, America & Australia. You will be given a tracking number which allows you to track the shipment. Obviously it’s cheaper to collect tickets in Thailand if you can, but if none of the collection points work for you, tickets will need to be sent to you. Note: They have stopped shipping services to any addresses on Thailand’s islands, as such shipments often arrive too late or simply dissapear. You can use the interactive form below by typing in your Origin (i.e. Bangkok), Destinations (i.e. Chiang Mai), choose the travel date and click on Find Tickets. Note: If you’re thinking of which class you should travel, you can check on Thailand Train Classes Type. Alternatively, simply go to 12Go.Asia. On the top of the website, you will see the fields for your origin and destination. Start typing the names of the places you want to travel, choose a travel date and the number of passengers. Next, click on the green Find button to search for your tickets. You will get to the second page where they show you all available trips on that route, sorted by means of transport and departure time. You will see different operators, classes and transit times. Pick the departure time that fits you most, then click on the green Buy ticket button and then the Checkout button on the appearing window. All you need to do next is just follow the on-screen instructions to add your personal details, delivery options and proceed to payment gateway to complete your order. If you need more detailed information on how to buy online tickets, click here and navigate to the Ticketing section at the page. 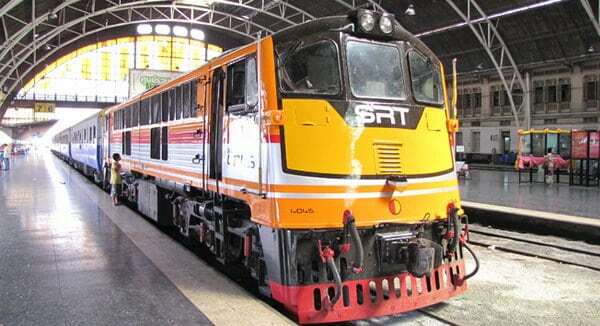 *Some information may change from time to time by State Railway of Thailand (SRT) and if you need confirmation, you may contact SRT over the phone as per below or refer to Thailand SRT Train Contact Information. Thailand Train time table and ticket price from SRT’s Website. If you have any questions, drop them at the comment box below and feel free to share this article via the social buttons.